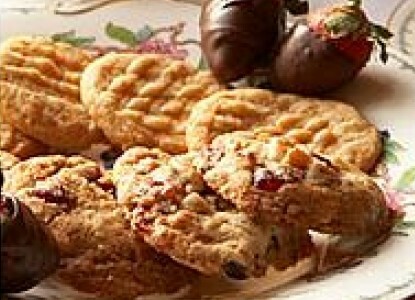 These wonderful cookies are always a great success with our guests when they come home to the inn hungry after a day’s exploration of the Cape. Preheat oven to 350 degrees F. Prepare several cookie sheets. In a medium size bowl stir together thoroughly the flour, cinnamon, baking powder, baking soda, and salt. In a large bowl beat the butter on medium speed until soft and fluffy. Add the brown sugar and orange marmalade and beat until well mixed. Add the egg and vanilla extract and beat again until very fluffy. Beat in the flour mix until evenly blended. Stir in the pecans, cranberries and chocolate morsels until evenly spread. Drop cookie dough onto cookie sheets, about a heaped tablespoon each, spacing about 3 inches apart. Bake for 8 – 11 minutes, rotating the sheets half way through for even browning. Allow to set for a couple of minutes before transferring to wire racks to cool.